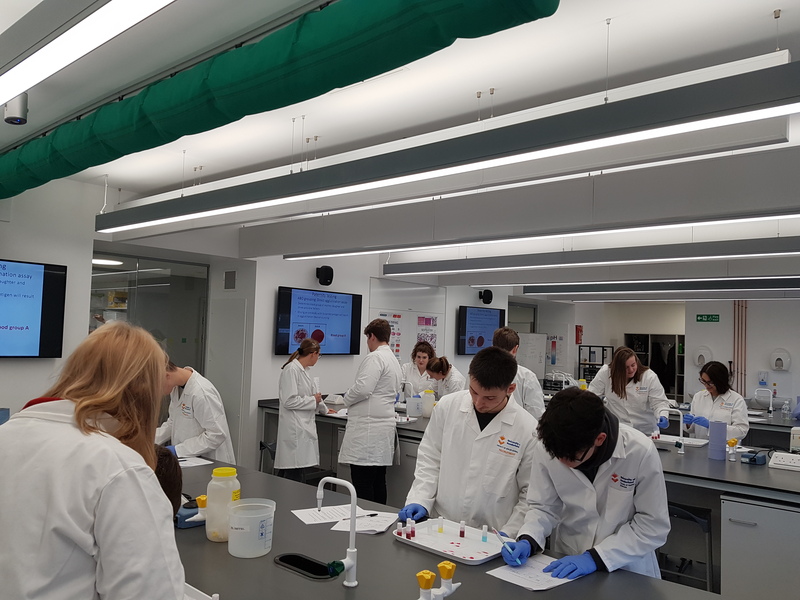 A group of budding Science students from QE have visited the University of Sunderland to obtain a preview of the new Medicine course which will be available from this September. The Medicine MBChB will integrate scientific and clinical learning allowing undergraduates to work with four hospital trusts, two mental health trusts, sixty-three GP practices and several community services. The tour provided students with the opportunity to see anatomical models and wards where work will be completed alongside trainee nurses, paramedics and other allied health professionals. They then participated in a practical session which included a blood type analysis and the preparing of tissue samples for inspection under a microscope. Student, Leigh Stabler, comments: ‘Gaining an insight into the practical aspects of medicine was amazing. The event was extremely eye opening and has given me the motivation to begin looking into higher education’. Alice Atkinson, Higher Education and Careers Adviser at QE who accompanied the students to the University, explains: ‘It was inspiring to see how students would be working together to develop not only their scientific ability but also their interpersonal skills, preparing them for the demanding but fulfilling work ahead’.